The individuals that put on the show (literally) have made appearances on the other side of the camera from time to time. In fact some of the funniest moments on Running Man involve a peek into those who film, write, manage, dress, and produce the show. 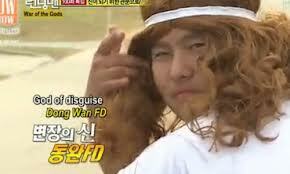 Let’s take a look at the daebek production crew we have to thank for making Running Man possible. FD stands for floor director, which has a whole range of duties (including giving cues, ensuring equipment is working properly, informing the director of action off camera). Despite the full workload FD Dong Wan still finds the time to cross dress, run a convenience story, and just be generally freaking awesome. Probably the second crew member in terms of time on the other side of the camera (Kwon Ryeol probably has about the same amount of time on air), FD Dong Wan is freaking hilarious. Often used to distract the RM during find the guest missions this man has sported a variety of wigs, dresses, and equally hilarious costumes in the name of comedy. Jae Suk’s VJ, Kwon Ryeol was first brought to the other side (other side of the camera that is) in one of the first few episodes. Often scolded by Jae Suk for his lack of fitness early on, Kwon Ryeol has morphed into the mostly loyal VJ that the nation’s MC counts on. The audio director, Meon Seon made RM history with an inadvertent picture taken of him relaxing during one of the late night RM shoots (episode 30). Discovered while the cast was playing a game of silly faces, it was decided that no one could top the photo of the pensive audio director. The picture still makes me crack up. One half of the Monday Couple that exists behind the camera (his Monday girlfriend is none other than Haha’s coordi), this VJ has a sense of humor and a likeable aura. He always makes me smile. Ha-ha’s cordi (stylist), Seon Ah is one half of the crew Monday Couple. With wit and attitude she has made her every appearance on the show viewing gold. My favorite Seon Ah moment was in episode 34 (which had many crew members appearing on screen in a game of 1 vs. x) when she responded to a comment Ha-ha made about her weight with a “Like you should talk”. Love it. The trio that runs the show, you will glimpse the three of them here and there. While not a huge presence on the actual show, they are the driving force behind it (with the writers of course). Thank you PDs. Thank you. Thanks! The VJs, other than Kwon Ryeol, have a tendency to switch up the cast member they are following around. I guess they need their variety too 🙂 I have not had the chance (sounds like opportunity) to notice Song Yong yet- please share if you have a pic. Love this show, thanks for your information. ooh, and one-two punch VJ, who are they..?